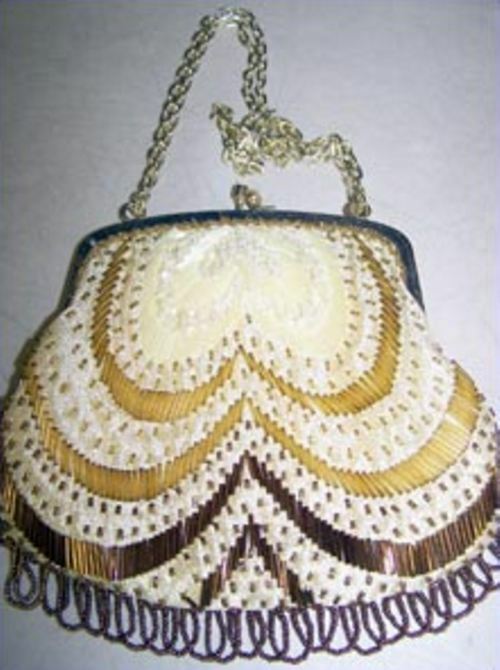 Here is a very attractive ladies handbag with beaded outside and fabric lined interior and fastener. The light yellow interior has one pocket with label. The background fabrick is beige with gold color strands that make a sparkly effect. It is covered with half inch long beads and 1/16 inch short beads. Loops of small round beads hangs from the bottom edge. The beads come in three colors: White, gold and bronze. Just one or two threads are loose. Other wise, almost new.. Very clean! No stains or discoloration. It's a beauty.